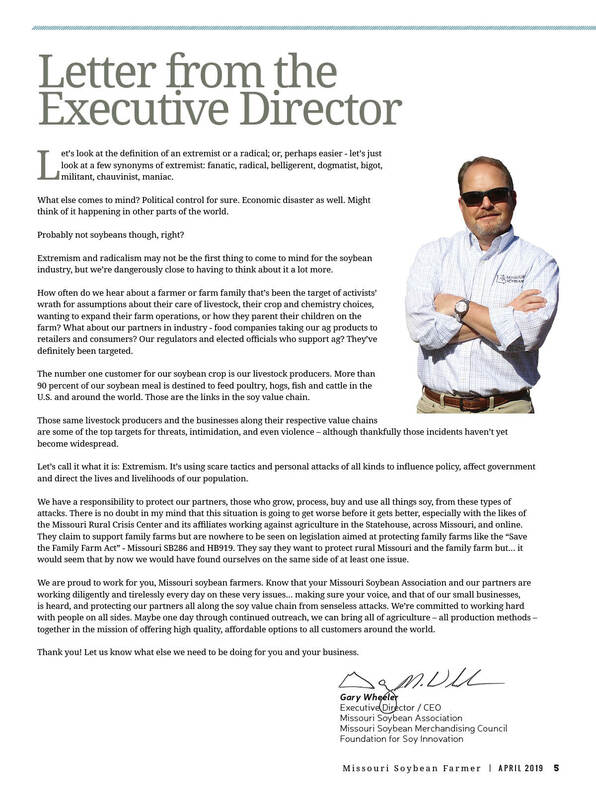 This letter was first published in the April 2019 issue of Missouri Soybean Farmer magazine. Let’s look at the definition of an extremist or a radical; or, perhaps easier – let’s just look at a few synonyms of extremist: fanatic, radical, belligerent, dogmatist, bigot, militant, chauvinist, maniac. What else comes to mind? Political control for sure. Economic disaster as well. Might think of it happening in other parts of the world. Probably not soybeans though, right? Extremism and radicalism may not be the first thing to come to mind for the soybean industry, but we’re dangerously close to having to think about it a lot more. How often do we hear about a farmer or farm family that’s been the target of activists’ wrath for assumptions about their care of livestock, their crop and chemistry choices, wanting to expand their farm operations, or how they parent their children on the farm? What about our partners in industry – food companies taking our ag products to retailers and consumers? Our regulators and elected officials who support ag? They’ve definitely been targeted. The number one customer for our soybean crop is our livestock producers. More than 90 percent of our soybean meal is destined to feed poultry, hogs, fish and cattle in the U.S. and around the world. Those are the links in the soy value chain. Those same livestock producers and the businesses along their respective value chains are some of the top targets for threats, intimidation, and even violence – although thankfully those incidents haven’t yet become widespread. Let’s call it what it is: Extremism. It’s using scare tactics and personal attacks of all kinds to influence policy, affect government and direct the lives and livelihoods of our population. We have a responsibility to protect our partners, those who grow, process, buy and use all things soy, from these types of attacks. There is no doubt in my mind that this situation is going to get worse before it gets better, especially with the likes of the Missouri Rural Crisis Center and its affiliates working against agriculture in the Statehouse, across Missouri, and online. They claim to support family farms but are nowhere to be seen on legislation aimed at protecting family farms like the “Save the Family Farm Act” – Missouri SB286 and HB919. They say they want to protect rural Missouri and the family farm but… it would seem that by now we would have found ourselves on the same side of at least one issue. We are proud to work for you, Missouri soybean farmers. 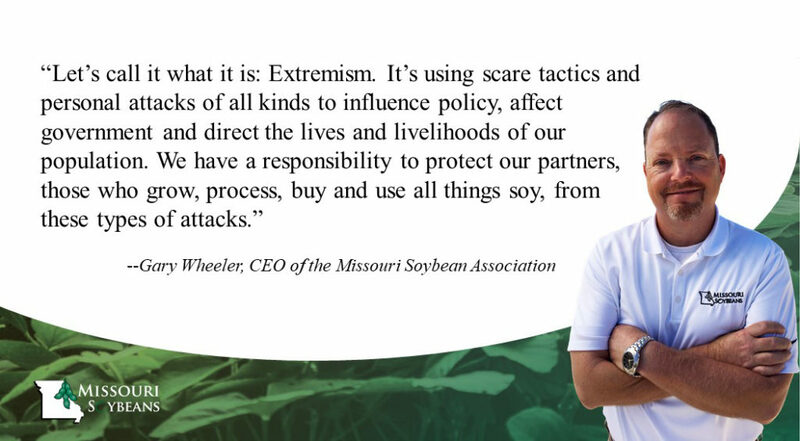 Know that your Missouri Soybean Association and our partners are working diligently and tirelessly every day on these very issues… making sure your voice, and that of our small businesses, is heard, and protecting our partners all along the soy value chain from senseless attacks. We’re committed to working hard with people on all sides. Maybe one day through continued outreach, we can bring all of agriculture – all production methods – together in the mission of offering high quality, affordable options to all customers around the world. Thank you! Let us know what else we need to be doing for you and your business. To see this letter and other content from the April 2019 issue of Missouri Soybean Farmer magazine, click here.